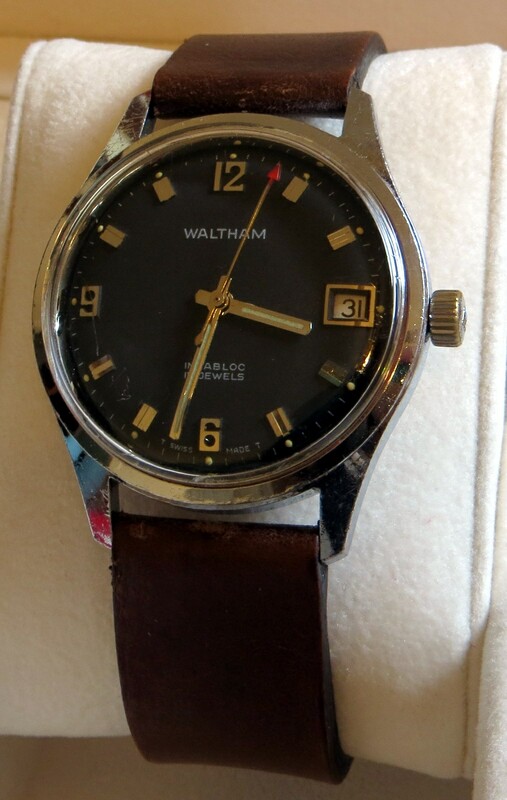 What we have here is a classic, Swiss Made, Waltham watch from the late 50’s or early 60’s. It features a clean, black dial, a hand-wound movement and classic look you have to pay big money for in a modern equivalent. The dial is a charcoal black and has held up very well, with no discolorations. The hour markers are applied rectangles, except for 12, 6, and 9 O’clock, which are a neat, blocky font. The hour and minute hands are simple sticks, with lume. The second hand has a red arrow tip, which really stands out against the dial and adds a lot of character to the watch. An easy to read date window in located at 3:00. The lume on the hands and dial are pretty much dead, which is to expected to a 50 year old tritium marked watch. The dial is simply marked Waltham and Incabloc, 17 jewels. t -Swiss -t, indicating a tritium lume. The crystal is acrylic and lightly domed. It was in pretty rough shape when I bought it, but I got most of the worst scratches out. The case is chrome plated base metal The case back is stainless, screw down and marked Waltham, Base Metal Bezel, Stainless Steel back. The crown is signed with a W and is easy to wind and set. The movement is a 17 jewel Swiss, with incabloc. The is some brassing on the crown, which is to expected. The lugs are 17mm, which means you are squeeze in an 18mm leather band. I have the watch on aged Fossil leather. The movement keeps good time and seems to have at least 36 hours of reserve. It tics at 18,000 beats per hour. The date is semi quick-set, using alternating between 10:00 and midnight. 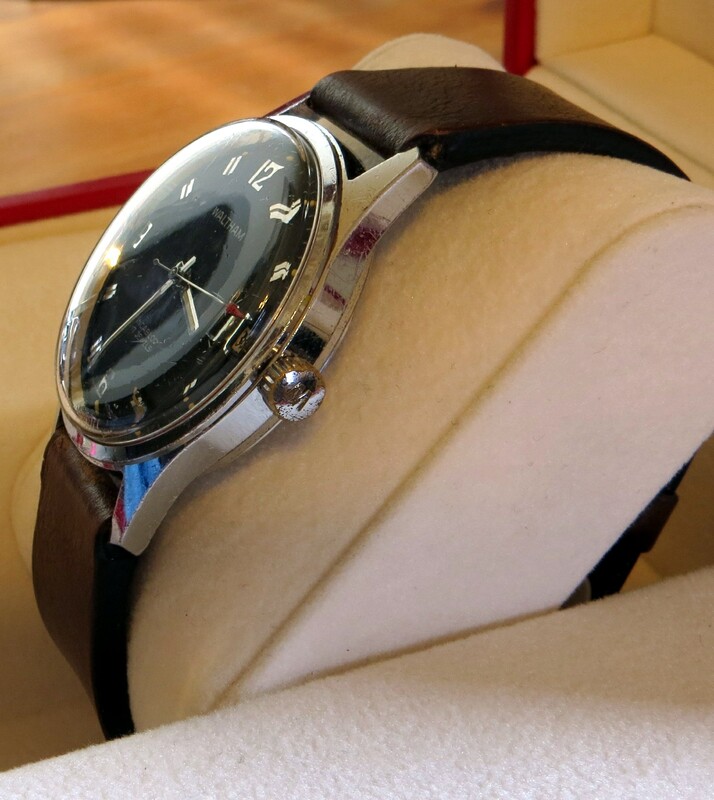 This is a classic looking watch, but may be a little small for modern tastes, at 34mm. Luckily, with my smaller wrists, it looks fine. It has held up quite well, and looks good on the wrist. It is one of the few Swiss made watches in my collection, and I enjoy wearing it in my rotation of watches. It does get at least one or two days of wear a month. I have about four Walthams in rotation in my collection, and I am happy with every one of them. Case: 34mm, chrome plated base metal. Movement: Waltham 18,000 BPH movement, 7 jewels Swiss Made, hand wind. 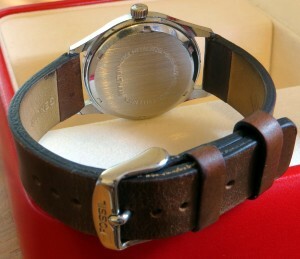 Other: On Fossil leather band, 17 mm lugs.